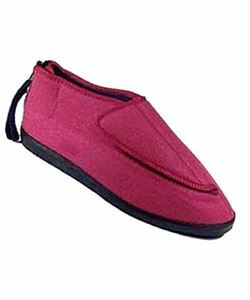 Ezi Fit slippers as the name suggests are easy to wear and adjust. There is an easy touch flap that makes it easier to adjust the slipper depending upon the swelling. There is a zip at the back that helps relieve pressure from the heels. Sole is anti skid which is a plus for elderly as it will prevent any falls. Wide fit shoe. Comes in pink and different sizes.